For this week’s Summer Shape-Up segment, I was challenged to create delicious and slimming dinners using ingredients they already had on hand. The end result? I whipped up shakshuka with zucchini noodles and veggie soup. Both are one-pot wonders, require only a few simple ingredients, and meet my Drop 10 TODAY criteria. Try them for yourself; you probably have most of the ingredients in your kitchen. If you love digging into a heaping bowl of pasta, then let me introduce you to your new favorite meal. 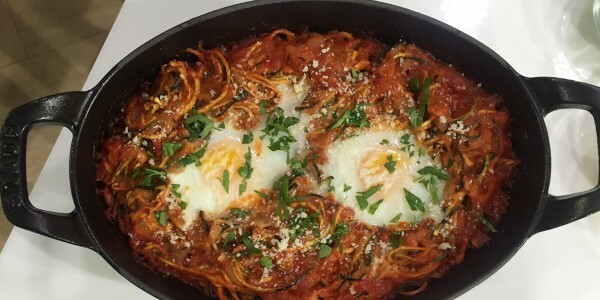 Shakshuka is a one-skillet dish that’s popular in Middle Eastern countries. I put my own spin on it by simplifying the recipe and replacing the side of carb-loaded bread with lighter, nutrient-packed zucchini noodles. Although it’s typically a breakfast food, shakshuka can be served any time of day — it makes for a delicious eggs-for-dinner meal. And did I mention you get a huge portion for less than 300 calories? Can’t beat that! This flavorful soup is a great way to use up leftovers so you don't waste food (or money). It’s incredibly easy to make — all you do is toss a few mainstay items into one pot ... and voila! You have a hearty and satisfying meal. There are a million (and one) variations depending on what veggies and beans you have on hand. Just stick to the rough ratio of about 3 cups of non-starchy veggies to about 4 cups of low-sodium broth. Feel free to add more veggies for a thicker soup. Grab your spoon and dive in. For more delicious recipes, check out Joy’s cookbook "From Junk Food to Joy Food" and follow her via Twitter, Facebook and Instagram.